Warnings and additional info: Strobe Lighting, OtherHaze and loud noises. Race Horse Company's massive international success Super Sunday is colourful, vivid and perky and was born out of the possibility of implementing our wildest dreams and bringing them onstage. Super Sunday is a combination of the company's basic elements in a humorous rollercoaster ride with a boneheaded approach and endless black humour. 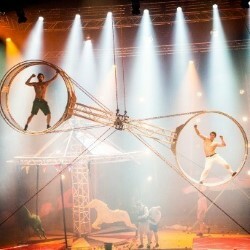 The death wheel is a new discipline for all of the performers and you've never seen it performed like this before. Super Sunday also includes double trampoline, a carousel, two human catapults, teeterboard, acrobatic balls, Russian bar and floor acrobatics.